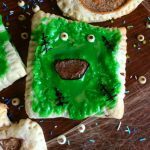 Fun Halloween Hand Pies are perfect Halloween desserts and they're kid friendly too! I made 3 different pie filling (pumpkin, jam and chocolate hazelnut spread + persimon) in 4 different shapes of hand pies. Fold in half of the 1/4 of the pastry. Cut out pumpkin shapes. Create "faces" on half of the pumpkins, these will be the top of the pumpkin shape pies. Cut circles out the second quarter of the pastry. Make sure you cut out even number of circles! Cut squares out the third quarter and rectangle out of the fourth quarter. Make sure they're even number too! Fill the pumpkins and the half of the rectangles with pumpkin filling. Mix the jam with red coloring. Fill the circles and the remaining half of the rectangles with it. Spread the chocolate hazelnut spread in the squares, then pile up the persimon on the top of the spread. I sealed the pies with a fork. Bake them in medium heat for about 10-15 minutes (depend of the size) or untill they're golden color. After the pies cooled down, decorate them with the chocolate eyes, the icing (for Frankenstein's monster I colored the icing green), the sprinkles and the details with the writing icing.